Pompeo (front-left), and Ghani (back-right). 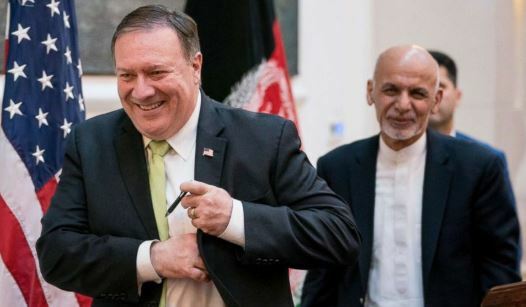 Secretary of State Mike Pompeo has reiterated the U.S. commitment to Afghanistan in a telephone call with President Ashraf Ghani, the Afghan leader says. “Secretary Pompeo stressed that there is no uncertainty and ambiguity about the U.S. commitment to Afghanistan and our enduring partnership,” Ghani tweetedon February 5. The telephone conversation comes days after President Donald Trump made clear that he wants to reduce U.S. military engagement in Afghanistan. The president said he planned to keep a small contingent of troops in Afghanistan for “real intelligence” purposes and said U.S. forces would return to that country if necessary. There are currently about 11,000 U.S. troops in Afghanistan, where the Western-backed central government has struggled to fend off a resurgent Taliban and other militant groups since the withdrawal of most NATO forces in 2014.